For reasons that are not horticulturally obvious, the poinsettia has earned its place in our culture. The plant doesn’t like the weather this far north of the equator, and it shows. Soon after we’ve pushed our overstuffed selves away from the holiday dining table, the poinsettia is ready to drop those tired, crimson leaves onto the hardwood floor. That’s OK by the buyer. It was nice and red while it lived. Americans love to overindulge and gawk at things so gaudy they have become beautiful. This is the entire business model for the city of Las Vegas. For the holidays, we embrace countless embellishments that are entirely impractical. • Keeping boxes of ornaments in the garage for 11 months a year. • Climbing slippery rooftops to attach blow-up snowmen. • Ugly Christmas sweater parties. • Wearing battery-operated bulbs as necklaces. Among all this silliness, poinsettias rank at the top of the will-not-survive list. We don’t even keep the plant around long enough to learn how to pronounce it correctly. 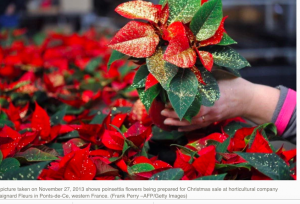 Native to the tropics, the only logical reason the plant is a holiday craze is because the leaves match Santa’s suit. By the way, the plant is not “in bloom” during the holiday. What actually occurs is that the leaves turn red. This happens only after the plant has been tortured through 12-14 hours of darkness each day. After the plants fade, we toss them into the green waste can, perhaps the same week as we offload the Christmas trees. Now, now, you might say, a poinsettia is a plant. A skilled gardener could keep it alive and trick it into producing red leaves again. Yes, but only through heroic efforts. I looked it up, just to make sure I’m not just being lazy. The tricks of the plant include moving it in and out of sunlight, keeping the temperature close to its native Southern Mexico and Guatemala, and the aforementioned timed dark solitude. (There’s also watering from the bottom and other such blather). I can’t really trust myself to keep enough gas in my car, how could I be trusted with such a lengthy checklist? Recently my friend Samantha sent me a “gardening idea” about poinsettias that are sprayed with glitter paint. Huzzah! If someone is going to the trouble of bringing this beauty to our dinner tables, we might as well go all the way and spray it into a more dazzling display. I’m quite certain the addition of chemicals could not be good for a living thing, but remember, the poinsettia is destined to dim. Those folks who are adding glitter to poinsettias may or may not have been the brains behind the blue flocked Christmas tree. Glitter is a happy thing. I wish they made cinnamon in glitter form. I could sprinkle it happily on my morning oatmeal. Pizza would have more pizzazz if crushed red pepper came in glitter form. Butter, chocolate and fake creamer — I think Americans would highly embrace glittering versions of these household items, especially in Las Vegas. That all being said, I much prefer when a beautiful plant has a chance for a longer life. If you’re grabbing something sweet for the table centerpiece, how about some forced bulbs in potted soil? The bulbs can be stored to force again, or you can simply put them in the ground and hope for the best. Thank you to the dear reader who dropped off some rather large bulbs at the newspaper this week. My coworker dropped them off at my house. Dear reader, if you have a chance, please drop me a note and tell me what they are. My guess is either amaryllis or naked lady (pink belladonna). Knowing what they are will help in my decisions about how best to torture them. It seems like much more than a month has gone by since the fires. It feels like we’ve been worrying about people, helping people and learning what has happened to people for a long, long, long time. Yet, nothing will be the same in our Northern California communities for a long, long time. I keep trying to search for the bright side. I know that there are more cars at Big Al’s Drive In because people are stacked two and three families deep in small apartments. Families who are guests are likely going out to eat more often to give their host families a little elbow room. I love Big Al’s, one of those throw-back places you just don’t see in most towns. Maybe this boom to business (with an unfortunate origin) will mean one of my favorite places for grease will be around when my students are parents. Where will all of these displaced people live? All of those people who are still in shelters, in tents at fairgrounds or renting RVs to park in their best friends’ driveway? Construction workers will have work for years to come, and those workers may very well seek some grub at places like Big Al’s, which will undoubtedly be in business until the rest of my hair turns gray. This is a gardening column, and I’m big into bulbs. I’ve written many times that planting bulbs is an act of hope. Its more than that, actually. It’s an act of hope with a very probable, happy outcome. Luckily, I already have bulbs in my classroom. Hyacinths. Last week when I spruced up my classroom before students returned, I rounded up the bulbs growing in vases of water. The roots were impressive in early November, but now they’re a watery tangle of tender white tendrils. I placed them in a circle with some of those battery-operated, tiny LED lights, atop some dark blue silk. I like to place little surprises here and there, then say nothing. I loved pretending to be surprised. I’ve never grown six hyacinth bulbs all at once indoors. I want to be surprised, so I’ll try not to imagine how amazing this will smell. Maybe it will mask that strange egg smell that comes from the watercolor paint. Or maybe they won’t notice. Over the break from school I scrounged a set of storage cubbies from a stack of salvage furniture at my school. I couldn’t wait for the kids to notice them. But for some reason, hidden in plain view, they walked right past them until Tuesday. Alas, I have still not planted bulbs in my actual yard. I’ve procrastinated in the past and placed bulbs in outdoor pots in mid- to late December. However, I wouldn’t recommend waiting any longer. If you don’t have bulbs, go buy some right now. We all need bulbs in the spring, when we’re driving past scorched earth and the parking lot is still packed at Big Al’s. The good thing about bulbs, is that there are many that you can grow all year-round. Gardeners.com, notes that amaryllis and paperwhites do not need to be chilled in the refrigerator. This can be especially beneficial if you haveur families sharing the same fridge. The indoor plants on the must-chill list include tulips, daffodils, hyacinth, crocus, Dutch iris and scilla. If you have room, plant them all. I’ve had great fun with small dollar store fish bowls with dollar store pebbles in the bottom. Just don’t forget to add water. I would use small glass food jars as well, but we’re using all that I can find for painting projects in my classroom. The easiest indoor bulbs, according to the website, are crocus, hyacinth, muscari and mini-daffodils. I made the mistake once of buying a giant bag of paperwhites at a big box store, and learned they were the giant variety. They were lovely, but grew so tall (and in my case long), that they sprawled over most of my kitchen table. If you plant bulbs indoors, let me know how it goes. I’d love if you sent a few digital pictures. These days I’ll take all the little jolts of cheer I can get. Blue sky and sunlight on fall leaves provided an exaggerated glimmer to my tired eyes. These simple images seemed like holiday lights after being cloistered in my house. I blame the hazardous air for my lack of exercise over the past two weeks. I blame second-hand grief and shock for my mass consumption of ice cream. I joke often about the medicinal qualities of chocolate. This month I wish I could pay for chocolate with my health savings account. Last weekend my family had a belated Thanksgiving dinner. I showed up with two boxes of those ice cream cones that are covered in chocolate, filled with chocolate and sprinkled with bits of toffee. Only two of those gooey goodies remain in my mother’s freezer. After dinner, a few of us noticed that we could see the sky. A walk! We could take a walk! Now I understand the excitement of the family dog when it hears the rattle of the leash. My mother’s ordinary neighborhood suddenly seemed glorious as our group walked under the recently-elusive blue sky. When I returned home to Chico, the gunky cloud had also lifted from over my house. I had not even thought to check my yard during the blaze and smoke. I was too busy checking fire maps and watching harrowing videos of escape from our nearby foothills. The grass outside my house was still damp from the sky-cleansing rain, and I scattered grass seed over bald spots in the yard. Then I realized I had missed the window for planting spinach. My students popped seeds in the ground before the Thanksgiving break, but I never got around to doing the same at my own house. The tomato plants should have been removed a while ago. Yet, the last time I checked that thick tangle of vines, there were red and almost-red tomatoes to harvest. A lot has happened since the last time I checked. I’m considering not planting spinach this year, but then I would have one less thing to write about. Just for fun, I’ve decided to let the kale plants remain. These are planted near the cyclone fence. Harlequin bugs ravaged those plants all through the summer, which was fine by me because this kept the bugs away from the tomatoes. I lopped off the terrible-looking tops, and now I’m curious whether the plants will revitalize. My research shows that kale can be considered a perennial in mild climates. The Vinca rosea (considered an annual in these parts), is going strong after six seasons. Maybe the partially-butchered kale will also survive the cold months. We’re in the season of holiday rituals, and I have my own garden rituals – like planting kale and spinach in the fall. Doing normal things also helps me forget that nothing around here will be normal again – not for a long time. Similar to most folks I know, I’m trying to shake this overall feeling of shock and depression – visualizing myself as a beautifully shaggy dog after a jump in a lake. Gardening has long been my way to do something with my hands and let my mind rest. Gardening is also an act of hope, because we can trust that something beautiful will grow. Yet, you can’t hide away the days in your back yard. I went to the south side of town to do some shopping. On the way, I drove past a triangle of grass near 12th and Mulberry streets, where about a dozen tents have been pitched. At the store, I maneuvered my oversized-cart around small groups of people, some telling the story of the loss of their home or the details of their current living situation. I felt my funk settling in. All those potentially-thoughtful holiday gifts were stacked on tall, metal racks and I sensed a suppressed sob well up inside me. I know myself. If I need a long cry, it needs to be somewhere other than the aisles of a big-box store. As I drove home, I was grateful to see that the trees along The Esplanade had waited to shed their leaves. The leaves could have shaken to the ground on one of those days when we were hiding behind N95 masks. Thank you leaves. We needed you. Recently our school community gathered for a meeting about how best to greet children when they return to school. Some of our children have gone through trauma, lost their homes or lost a familiar home of a close relative. Even those of us who are not so close to the ashes are in distress, a shadow over our hearts that will be long remembered. I knew becoming a teacher was a great responsibility. As I sat in the auditorium filled with strong, compassionate teachers, I was glad I will have my amazing coworkers by my side as we navigate the next steps together. Winter pruning can be a multi-step process. Sometimes the second step is fixing your mistakes. This year I almost made the big misstep with my grapevines. Months ago, I chatted with Mark Carlson, the man behind the pruning shears in a series of how-to-prune videos. I took notes that afternoon and specifically wrote to lop off 5 feet on each end of the vine. I trimmed off 5 feet, but the vine still stretched halfway across my cyclone fence. Recently I traveled through the wine country with a friend who was visiting from South Korea. Of course, Mark had meant to trim the plant and to leave only 5 feet of growth on either side of the main cane. Grapes with untamed tendrils are only meant to create ambiance in the courtyards of Italian restaurants. It’s hard to cut back a plant so harshly. It feels cruel. However, we’re really giving the plants the equivalent of a new, teenage body. The new growth hasn’t had a chance to get haggard through sun and rain and the passing of stray dogs. In Mark’s how-to-prune roses video, he suggests pruning the plants to about knee high. His technique is especially brutal. He wears gloves and uses long loppers, cutting off more than half the plant without a glance. Later, he pushes aside the thorns and goes in for a more precise trim. That’s the equivalent of putting your long hair in a ponytail and making one big chop before a pixie haircut. Marks also noted that grapes need more than a pile of fresh compost to make them grow anew. He suggested a good tree and vine fertilizer application this month. You could do the same for any other fruit tree. Saturday is the Handsome Woodsman’s birthday. I’m glad he was born. It’s been more than a year since he died in an automobile accident, but I say hello to him several times a day. The oversized photograph from his memorial service is on the bookshelf. I see his face as I turn the corner into the kitchen. He never liked to have his photograph taken, mostly because he thought he would look goofy. Those are the moments I have captured in photographs. Usually I walk through the kitchen and say hello. Other times, usually when my mind is quiet, I’m surprised by how much it still hurts. This December I had a “movie moment.” We all have them — color-filled times that we know are important to our personal storyline. In my case I was writing Christmas cards. I sat on the living room floor with red envelopes displayed in an arc. Things had changed. Life was good again. I was writing dozens of Christmas cards to people I loved. A year earlier, the death of Dave had surrounded me like a cave. Back then I had also sat on the living room floor writing letters. They were thank-you notes, written to people who had sent me sympathy cards. Letter after letter after letter … Even at the time I realized writing those letters could keep me sane. This year I was able to write Christmas cards for the joy of writing Christmas cards. Saturday will be the Handsome Woodsman’s birthday. I’ll share more moments with him on that day. I also know I’ll be OK. I remember a day when it did not rain. This was in October, last month, which now seems like a distant memory. I was in my classroom and a friendly face peeked through the doorway to say we’d have rainy day recess. I must admit, I panicked. I had been with my class for several weeks, but had not yet prepared for a rainy day recess. I knew where the indoor games were located. In fact, they were hidden under a table, carefully covered by a lace tablecloth. Behind the cloth barricade were dominoes and board games, marbles and card games. If a child was locked indoors for hours, that little corner could provide hours of fun, and a huge mess. A 20-minute rainy day recess is cause for game frustration. Twenty minutes means 10 minutes to spread the game all over the floor, seven minutes to play and eight minutes of my voice asking children to put the games away. I had not prepared for rainy day recess. I should have chosen four easy activities that would be quick to pull out, fun to play and lightning fast to clear away. Rainy day recess? Could I convince the children to draw at their desks? Could I lead a rousing game of hangman on the chalkboard? Could we play vocabulary charades? The children were excited about rainy day recess. They had peeked into the game corner. They knew they would find marbles and puzzles, interesting rubbery bands that could be used to launch projectiles. I think I was the only one who had vocabulary charades on her mind. Luckily, the rain was really just a mist, which became fog, which became just dandy weather for children to go outside to play. Believe me, I’ve spent some time since then deciding what remained in the rainy day game stash. I have also spent some time wishing that it had rained that day. I wish it had rained hard and continued raining through Halloween and well into November. For weeks and weeks, I waited for that first drizzle on my windshield. I watered the potted plants on my porch. I theorized about how long the clumps of grass could go without water before I could no longer call that area a “lawn.” I worried about my gardenia and fig tree, but never worried about 10,000 homes and the loss of life too onerous to quantify. Before the fires swept through the area I had planned to write a long rant about the lack of rain. I was harvesting ripe tomatoes in November. My students were wearing shorts to school when they should have been tracking mud onto clean linoleum. My potted plants were in trouble, and now we know that all of Northern California was in trouble. Then everyone in the world knew we were in trouble. Water can’t wash away our collective sorrow, nor the memories of what was lost, but they may stop the spread of more destruction. Maybe some of those firefighters can return home and spend time with their families. Toxicants in the air will wash out to sea, bits of destroyed lives will become diffused. There’s more to say about all of that — much more. But we need to take each day at a time. This is a column about gardening, and I did spend a few minutes thinking about plants this week. I wondered if the smoke in the air, so harmful to our respiratory systems, could also damage plants. Our plants are fine. Because plants use carbon dioxide, the smoke provides all that sugar-boosting stuff plants need. Last weekend I was at the Patrick Ranch along the Midway. The daisies looked just fine. The haze from the sky sent a gentle light over the colorful petals. Life, sometimes in beautiful forms, goes on. I’m looking for bright spots these days. Lingering smoke isn’t the only thing hanging in the air. A cumulative heartache is drifting through the valley. You can literally hear it. My friend Michael and I went to Walmart soon after people fled their homes. I wanted a distraction; aimlessly shopping is better than the type of thinking that takes place in silence. At the store, strangers talked about lost homes and cars, pets left behind. The brief chats often ended with the conclusion that all would work out well in the end. This was before the empty land near the store became a tent city. Folks seemed to be especially kind to one another that night, early in the tragedy, saying thank you and making room for one another in the aisles. Our clerk shared unsolicited snippets she had heard since the start of her shift. RVs lined the back rows of the parking lot and food trucks had served meals to the many. Yet, you can tell when a smile is a bit feigned, and I knew all of us were still very much in shock. Those first few nights I stayed up until the wee hours, watching the 24-hour newscast and pouring over the Cal Fire incident report maps. I watched Paradise Post Editor Rick Silva on Facebook as he drove through neighborhoods that look like they were stomped by a dragon. I don’t live in Paradise or Magalia, Butte Creek Canyon, Concow, Butte Valley or beyond. My home is safe. The only physical thing I can complain about is ash on my car and the need to wear my N95 face mask outdoors. However badly I am feeling (this hard-to-describe dull ache), is nothing like the jarring reality my displaced friends must walk through. There are so many. So many people I genuinely love, who raced to a nearby couch or distant town to escape something huge and hot and scary. Rather than make phone calls right away, I sat at home and made lists of people I knew had lost their homes. I added names of people who had probably lost homes. I scoured social media for reports that friends were OK, but I did not pick up the phone. I ate gallons of ice cream. What’s interesting is that I was in the news business for 25 years. When tragedies occurred, and there were many, we raced toward them. Camera in hand and a notepad on the passenger-side seat, there isn’t time to think. You go, you do, you think later. With time on my hands, words failed me. I convinced myself that whatever I said to friends would be an interruption. How could an unhappy face or a trite “I’m so sorry” on Facebook make a hoot of difference when something so bad had happened? Then a friend called to give voice to her own angst. “I can’t stand this. I feel like I need to be doing something,” she said. Frankly, I wanted to go to the movies. I wanted to escape. I wanted to eat more ice cream. She was right of course. The best way to drown out the uncomfortable noise in your head is to do something with your hands. We helped. I felt better. Just a day later, the snippets I overheard at the evacuation center were not as hope-filled. People were searching for loved ones, others needed a cellphone charger. The line at the shower was long and children had grown bored with coloring books. Volunteer coordinators needed a long nap. However, I had forgotten about the knot in my own stomach. Afterwards, was I able to make phone calls. Only then could I hassle people who had not signed up for the Safe and Well website. I sent simple texts to say “thinking of you,” and posted dozens of unhappy faces on social media. Sometimes you need a friend to remind you how to cope with reality. Since you asked … Yes, my students are learning about plants. Some days I am reminded that my enthusiasm is contagious. Weeks ago, I brought a hyacinth vase into the classroom with a dull, gray bulb perched just above the waterline. When I toured the room with the vase, even I was not impressed. The glass container went atop a high shelf, away from the reach of curiosity. We’re learning about months of the year, days of the week, etc. I couldn’t help but give an overview of the crops that grow in this area and the work farmers do each season. I spent 17 years writing about local farming, and I’ve toured most local crops during most seasons. It would feel like a shame to let all of that information go to waste. When I described spring, I talked about the small planes twirling through the sky, flying low above six inches of water. Ripples spread across the smooth surface of the flooded fields; rice scattered like a hard rain. The descriptions of autumn included trees shaken by vehicles that looked like they should be on the moon. I described the lobster-like claw and how nearly every nut falls to the ground in seconds. These kids may not have seen local farming in action, but they certainly saw it in their imaginations. When we worked on an art project — the life cycle of a sunflower — it was hardly a stretch to revisit the hyacinth bulb, still unimpressive, but now with roots growing into the water. The children appeared mildly interested, and I tucked the vase away, again in plain view. One day, one of the boys tugged at my arm with excitement. I am not certain that any of the other children were impressed, but he and I knew the moment was magical. If you’re thinking about what to buy me for Christmas … I would like a Costco-sized bag of miniature paperwhite bulbs, and perhaps an amaryllis or two. Throw in several bags of clean pebbles from the dollar store and some shallow planting containers, I might add you to my list of Valentines. I always try to time the planting of winter greens for the days right before a good rain. Sadly, the rains should have been here by now. Instead, we’ve had days that reached 80 degrees. If I had known the weather would hold, I would have continued to water the mystery squash growing along my fence line. I still recommend placing seeds of spinach and kale in the ground right about now. The garden books also recommend planting broccoli. However, I’ve had nothing but mediocre luck with this cruciferous vegetable. Broccoli sits in the ground all winter, growing imperceptibly. Then it bolts and makes flowers. Last year I learned you can eat the leaves. This is nice, I suppose. However, I would far prefer to eat Tuscan baby Kale. This particular seed packet is worth the investigation. If you harvest often in the early spring the leaves keep coming, small and not stringy like the kale you now and hate. When the plants get larger and woody you can go through the rigmarole of massaging the leaves so that the more mature kale is edible. Two weeks ago, we planted spinach and kale in our school garden. I checked Monday and the sprouts were about an inch high, just in time for our lessons on measurement. If you have children or grandchildren, please help them grow sugar snap peas. You can fill a paper bag with hundreds of bulk seeds at Wilbur’s Seed and Feed on Meyers Street in Chico, http://wilbursfeedandseed.com. Place a few in a dish with half a tablespoon of water. Check the water each day. In about three days the magic begins to happen. There’s nothing like a thick, perfectly obvious seedling to teach the life cycle of a plant. Bonus that they serve examples of green snap peas in the school cafeteria. If you want to add in some reading comprehension to your garden lesson, read Jack and the Beanstalk later that night. When I brought in the sugar snap pea seeds, my students didn’t really know what was in store for them. Neither did I. This is not the right time to plant them. I just knew I had seeds going to waste in my cupboard and I should take them to school. When I showed the children the sprouts, they looked mildly interested. Some noticed them when they were washing their hands at the sink. I teach at a charter school and my children eat lunch in my classroom. A few weeks ago, I announced that the first children who finished their lunch and cleaned up their desks could help plant the seedlings in soil. Most of the children didn’t hear me. A few did hear me. Those few managed to clean up their desks at a speed for which I would not have previously believed they were capable. I had intended to only grow five plants in the classroom. That’s because I had only five small plastic pots in a pile at the side of my shed. A garden volunteer stopped by the class and I bragged about my seedlings. Soon more pots appeared. Most importantly, more children learned how to clean up their lunch quickly. Now the question is what to do with these beauties. The plants are balanced precariously on a chair in a south-facing window. It’s the wrong season to grow them. The happy tendrils are ready to grab onto something. The children still have work to do to prepare the planting area. The plants might die over the winter. But I can’t be bothered with realistic details. The plants are beautiful just as they are. You remember what a magical place a garden can be when you’re looking through new eyes. Recently we had our first real work day, if you can call it that. Three adults were ready to guide young hands in some serious weed-yanking. I had crammed in a lesson about the life cycle of a plant — from seed of life, the taking of nutrients, air, water and sun, then the full circle of seed production. That information may or may not have been absorbed by young minds. However, I am certain that the class wanted to be outdoors to see things for themselves. This was our first foray into the actual garden. The children were gentle at first, as if walking into a postcard. White “butterflies” glided through the air and green tomatoes clung to the tall plants. One white flying creature (a cabbage moth if you haven’t already guessed), landed on a boy’s finger and stayed there for a long time. I think I saw this scene in a Disney cartoon, with Snow White singing in a lovely soprano voice. Another boy yanked some weeds, but was soon digging in the soil with a stick. He kept digging because he kept finding things — a worm, a slug, an earwig. A crowd gathered to view these new wonders. I followed the lead of the garden moms, who asked children to bring snails and slugs to a bucket, where the living creatures would be removed from the garden. Two weeks later, the garden adventure included adding heaps of fresh soil to the garden beds. We had intended to plant seeds of spinach and kale. Yet getting their hands dirty was so much fun we ran out of time. I might need to get my kids out there sooner than our allotted garden time. Should we shave some time from a math lesson? Is gardening more important than math? I’m thinking we’ll make a point of measuring how much the plants grow and count seed-planting as part of the equation. Once upon a time I would spend many winter hours reading gardening books. (Remember books? Those are those things we dusted before we learned to do a Google search). I bookmarked pages and made lists. I kept a list of things I hoped to remember at the appropriate times, like when to plant seeds indoors or outdoors. I checked seed packets and counted back 12 weeks from the last frost. I learned the date of last frost in this area. It’s around April 30, my birthday, which is easy to remember bit.ly/ChicoFreeze. I learned a lot of things the hard way, such as not to expect much from broccoli plants. I also stopped planting tomato seeds in January in the window sill. That was just silly. You can buy two plants for five bucks in May. All of that … and I don’t worry about gardening much anymore. I plant what I want where I know it will grow. Mostly I learned that if something doesn’t grow, there are always more seeds and plants where those came from. This month I’m sharing a few tidbits from things I learned more recently. You can do what you want with this information. If you end up including it in a book, I’ll be happy if you buy me lunch. Most people plant Vinca rosea as an annual. This Vinca is dramatically different than the invasive Vinca we call periwinkle. Also known as Madagascar periwinkle, Vinca rosea is sold in early spring in six-packs and has shiny leaves. The flowers are similar to Impatiens, yet will thrive in the blazing sun. Typically, the plant melts with the first frost. Last year was rather mild and I tried an experiment to keep my Vinca rosea alive. I had read it is technically a perennial plant, but only if you’re living in a climate like Madagascar. My blooming treasures were growing in one of those faux wine barrels, made of hard plastic. When I saw that the nights would dip below freezing, I covered the plant with another faux resin wine barrel. Some of the leaves received damage, but for the most part, the plants survived. Then they thrived. I moved the barrel to the entrance of my walkway. The first thing I see right now when I walk toward my front door is a flowering success. After a long day of teaching, I need that. Just for fun, I’ll try to keep the plant for a third year. I learned that Vinca rosea goes partially dormant in the cold weather. You won’t notice, but the plant isn’t growing. At this time, its best to keep watering to a minimum to avoid fungal disease. You can also make new plants of Vinca rosea through cuttings. Who knew? Yet, we’re getting near the window of time when this will work. The SFGate website recommends cutting a stem at a leaf base and putting the stem in fresh potting soil. Many people also use a rooting hormone to increase their success. One of the key ingredients of rooting hormone is often a synthetic version of indolebutyric acid. (No, children, you will not be tested on that word). Oregon State University’s Cooperative Extension online article “How to Make a Rooting Tonic“ has a step-by-step method for making a rooting tonic that includes the acid with that impossible to pronounce name. • Collect two cups of willow branches or three cups of willow bark. (Young branches include the highest concentrations of the acid. The branches should be fresh, not gathered from the ground). • Cut the branches into small pieces, 3-6 inches. • Place the pieces in a large pan. • Boil one gallon of water and pour it over your clippings. • Let sit for about a day. • Pour the magic willow water into glass jars with lids (after taking out the branches). You can store the liquid for about two months. When using the willow water, soak the tips of your plant cuttings for several hours in the willow water. The goal is to thwart bacteria, fungus and viral diseases. Some people also dip their plants in honey, or boil water with honey before soaking stems. The “How to Make a Rooting Tonic” article also includes a few words about trying this.